first exhibit in the door at last year's cycle show was a replica of phloyd's time trial bmc bike with a very droolsworthy single carbon chainring - or at least the flat disc part was all shiny carbon fibre. the teeth were in the more prevalent alloy and bonded to the carbon. and that's pretty much what most of us would think if the subject of carbon chainrings comes up in conversation (i know, i know). but hansell composites ltd in middlesborough, englandshire would beg to differ. under the fibre-lyte brand name martin and john hansell have been fabricating carbon bits for bicycles, motorcycles and motor cars since 1992, and currently turn out a rather tasty range of carbon chainrings - teeth and all. all the cyclists to whom i have mentioned these have had the same intitial reaction as myself, along the lines of 'that'll never work' or 'they'll break as soon as you put any pressure on them'. however, i have been wrong before (several times), so it seemed like a good, if slightly worrying idea to ask if i could road test a pair. after all, if the hansell's were selling them, surely they'd be alright - wouldn't they? with a beezer of a carbon test bed installed: colnago c50, chorus carbon chainset and a pair of lightweight ventoux, if nothing else they would look great in the photos (and they do) hansell composites sent up a pair of their lightweight 2 chainrings. these were the version recommended for the regular road cyclist, and acknowledging that their expertise with carbon was worth more than my obsession, i asked for a 53/39 combination. fibre-lyte rings are manufactured as a pair in order to optimise the lift pins and teeth profiling for smooth gear changing. carbon fibre construction is a laminate process, and you can probably surmise for yourself that shifting the chain from the inner to the outer is probably just what a laminate doesn't need. anything that will lessen the chance of chipping or delamination is to be encouraged and certainly purchased. however, the rings are manufactured in one piece, meaning the teeth are integral and not bonded. 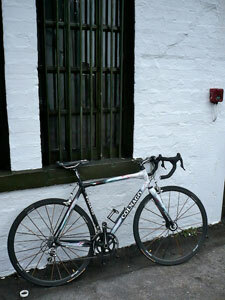 there are a number of styles of ring to choose from - the lightweight 1 is remarkably similar to the original campag ring and weighs 43g for a 53 ring (about half the weight of the campag equivalent), while the lightweight 2 (on test) is slightly sturdier and heavier at 52g (if heavier is indeed a suitable adjective at these weights). there are solid, slotted, aero et al, so the choice is pretty wide and can be custom manufactured to any bolt circle diameter - order according to your chainset. since the colnago had the chorus carbon chainset, four of the bolt holes on the 53 ring were counterbored, with only the hole that affixes to the rear of the crank arm being normal drilling. the rings came with detailed fitting instructions which, followed closely, resulted in installation taking mere minutes. the 53 ring has a notch to aid proper alignment with the crank, and if you were ever so more pernickety than i, you could even align the carbon weave on each ring. my artistic temperament couldn't live with that, even if i can't see it from the saddle, so i set the weave direction as shown. the outer surfaces of both rings are clearcoated which makes them look superb. in fact, even though fibre lyte might not like me saying, it would be worth fitting these to your bike for purely aesthetic reasons. so, just to prove what a thrillseeker i am, and bear in mind that i am the only cycle repair facility north of port ellen, i climbed on the colnago and cycled to jura (to place this is in perspective, bowmore to port askaig is just under 20km with a five minute ferry trip to jura. this is the island to the north of islay, and the road to craighouse is around 15km of uphill single track and very few signs of population - jura's total population is around 150). effectively this meant that if teeth started removing themselves from either ring during the latter part of the journey, it was a long walk home. however, despite some serious climbing and sheep avoiding, the only creaks came from the rider, and the following day, there was a lot more climbing returning from bunnahabhain. sufice to say there are still 39 teeth on the inner ring and 53 on the outer. instructions delivered with the rings warned not to change up when riding under pressure - fortunately i have never found the legs to go to the big ring when climbing, but regular changing on regular roads was seamless both up and down, with initial misses being entirely due to pilot error (being too cautious). 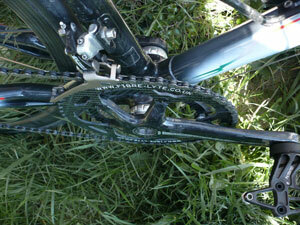 as mentioned above, they look great and they function just as you would expect chainrings to function. in this case, the rider is neither a power monster nor a heavyweight, but i do give it welly on the climbs (especially when wearing a millar jersey:-), so i figure i've given them as much of a workout as anyone else would. so what does this carbon toothed exotica cost. well a 39 tooth ring will lighten your wallet by £64.69 while the 53 ring costs £81.47. while i agree that you could manage a whole chainset for that money, if light weight and aesthetics are ideals that you pursue on the bike, this has to be the frosting on the cake. and if you do have the sort of legs that will propel you faster than a speeding bullet, the website lists up to a 65 tooth chainring which would probably fit the paddle steamer waverley. and according to stephen at fibre-lyte they can make chainrings of almost any size - they've just supplied an 80 tooth for a uk time triallist. and that would bring tears to your thighs. so i was wrong yet again. 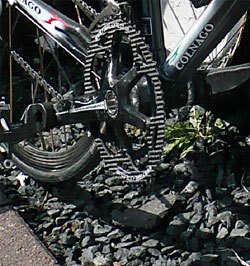 for some reason most of us cyclists seem to have this notion that carbon fibre is a very brittle material and that making the chainring teeth out of carbon is fine for relaxed pedalling on a flat road with a tailwind, but not much else. well, i beg to differ. despite being out in the sticks on roads that only barely resemble that description, i have been, and will continue to be, more than happy to cycle obscene amounts of kilometres with nary a worry about my transmission. 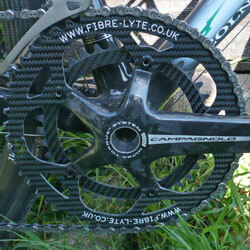 fibre-lyte manufacture chainrings to order depending on individual requirements. sizes and prices can be obtained on their website.